Always in search of innovations that will deliver guests an unforgetable WOW experience Royal Caribbean is introducing the Royal Suite Class experience. Designed for the most ‘discerning’ adventurers, Royal Caribbean promises guests will enjoy an experience like no other featuring a wide-range of benefits and amenities that they expect from a world-class luxury vacation. Available for sailings beginning May 2016 aboard Royal Caribbean’s Oasis- and Quantum-class ships, Royal Suite Class will offer a wide range of exclusive amenities based on a three tier service level . Premium features include a butler, free VOOM (the fastest internet at sea), complimentary specialty dining, an ultimate beverage package, inclusive gratuities, preferred seating at select onboard venues, and upgraded room amenities. Based on suite category the Royal Suite Class comprises three service levels: Star Class, Sky Class and Sea Class. A ‘first’ for Royal Caribbean, Star Class guests will receive the new and complimentary Royal Genie service. The Royal Genie trained and certified by the British Butler Institute, will serve as a personal assistant to help guests with nearly everything and anything, 24 hours a day. Royal Genies take care of restaurant and show reservations, in-room dining requests, and any other needs – from laundry, pressing and shoe shining, to luggage handling and unpacking. In addition, the Royal Genie will pamper guests with handcrafted cocktails made in-suite as well as assist in creating and reserving customized shore excursions. 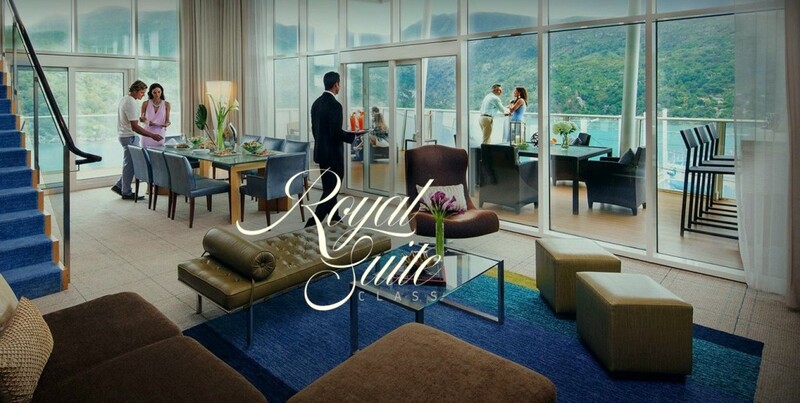 The Royal Suite Class experience promises to be upgraded, personalized and exclusive. Upgraded Amenities: guests in the Royal Suite Class will enjoy the ultimate ‘home away from home’ with upgraded amenities, such as Hermès, Ferragamo and L’OCCITANE bath products and luxury pillow top mattresses. Star Class guests will luxuriate in their suites with exclusive Duxiana DUX mattresses and Frette linens. Personalized Experiences: luxury is defined by personal experiences and onboard a Royal Caribbean ship it is embodied by the crew and unmatched tailored service – from a personalized welcome gift to a guest’s favorite cocktail before dinner, guests will feel as if all their personal preferences have been met. Exclusive and Priority Access: Royal Suite Class guests also will have exclusive access to the California-chic Coastal Kitchen restaurant reserved for Suite guests only. On Royal Caribbean’s private beach paradise Labadee, Haiti suite guests enjoy access to the exclusive Barefoot Beach and have the ability to reserve private cabanas on the island. Additionally, Star and Sky Class guests enjoy a private Suite Sun Deck and reserved VIP seating in entertainment productions, like fully licensed Broadway musicals and Oasis-class’ AquaTheater high-diving spectaculars. Reading about Royal Caribbean’s latest innovation I have to admit guests, especially those staying in the Star Class, will experience a true ‘RoyalWOW‘. Having looked up the definition and synonyms of ‘discerning’ ( selective, tasteful, refined, cultivated, cultured, sophisticated, enlightened, sensitive, subtle, critical, intelligent, perceptive, clever, insightful, percipient, ingenious, sharp, wise, erudite, aware, knowing,…) I can only conclude Royal Caribbean has created the Royal Suite Class for us! Hey, love this fantastic piece of writing, entirely and very well explained, keep it up!